PG-13 | For intense sequences of violence and action, some frightening images, thematic elements, a suggestive situation and language. Catching Fire, despite its lengthy run time still felt rushed especially when the action switches to when the tributes are in the arena. I had read the book Catching Fire shortly after the first movie was released, and from what I remember, the movie follows the book quite closely as far as key events. From the screening I was attending, a lot of the viewers were upset with the abrupt ending. But if you had read the book, then you wouldn't have been surprised of the abrupt ending. You kind of expect that though with long book series or books such as the last Harry Potter film breaking into two movies or even The Hobbit. What I like about the movie which continues from the first movie is the great acting, costumes and scenery in the film. From Jennifer Lawrence as Katniss to Elizabeth Banks as Effie Trinket, the actors and actresses does an amazing job in bringing the characters to life from the book. What I like about the first movie in comparison to the second is the character development in the first movie of the various characters. It is definitely lacking in the second movie. We get several scenes of Katniss and Gale together and Katniss and Peeta. But you don't get the sense of the chemistry that Katniss and the two men in her life had in the first movie. Aside from Finnick Odair (Sam Claflin) we don't really get to know the other new characters' history. The book definitely goes into more details as far as the characters and about the revolution brewing. There's one key scene missing from the book which involves the rumors of the destroyed District 13. But I guess it may be left out due to time constraint or for a bigger impact for the third movie. I am glad they kept intact the whole "clock" obstacle of the Hunger Games and the wiring to the tree. To me that was the most interesting part of the book and the movie. 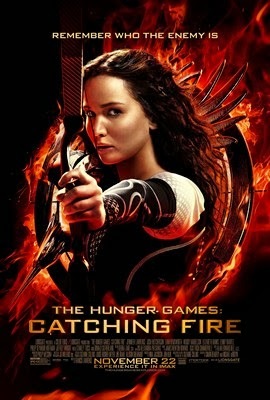 Overall, I enjoyed the movie and would recommend it to fans of the first movie and readers of the book. The entire premise of the Quarter Quell is very interesting, with the former tributes fighting each other as a solution for President Snow (Donald Sutherland). Unfortunately a lot of the deaths were not on screen, perhaps to keep the PG-13 rating. Despite this I would still recommend you watching it and follow up with reading the book.